We’d love your help. Let us know what’s wrong with this preview of Chopin's Piano by Paul Kildea. 'Beguiling ... Limpidly written, effortlessly learned' William Boyd, TLS, Books of the Year In November 1838 Fr�d�ric Chopin, George Sand and her two children sailed to Majorca to escape the Parisian winter. They settled in an abandoned monastery at Valldemossa in the mountains above Palma, where Chopin finished what would eventually be recognised as one of the great and r 'Beguiling ... Limpidly written, effortlessly learned' William Boyd, TLS, Books of the Year In November 1838 Fr�d�ric Chopin, George Sand and her two children sailed to Majorca to escape the Parisian winter. They settled in an abandoned monastery at Valldemossa in the mountains above Palma, where Chopin finished what would eventually be recognised as one of the great and revolutionary works of musical Romanticism - his 24 Preludes. There was scarcely a decent piano on the island (these were still early days in the evolution of the modern instrument), so Chopin worked on a small pianino made by a local craftsman, which remained in their monastic cell for seventy years after he and Sand had left. This brilliant and unclassifiable book traces the history of Chopin's 24 Preludes through the instruments on which they were played, the pianists who interpreted them and the traditions they came to represent. Yet it begins and ends with the Majorcan pianino, which during the Second World War assumed an astonishing cultural potency as it became, for the Nazis, a symbol of the man and music they were determined to appropriate as their own. To ask other readers questions about Chopin's Piano, please sign up. It's rather odd that they (same author & publisher) are planning to publish a book with a very similar title "Chopin's Piano: A Journey Through Romanticism" next year (2019), and make a movie about this 2019 version. Would it be the same book republished with a new title as part of the movie deal (read about it in the Guardian)? Or a reformulation of the same material? is this historical fiction? I can't figure it out! Kortians No, rather historical non-fiction I'd say. I remember listening to a sports talk show on the car radio a few years ago and one of the two hosts, perhaps to show the breadth of his other-than-sports knowledge, said in as challenging a tone as possible to the other host that U2 was the greatest rock band ever. As if no other opinion was even thinkable. I remember thinking: a) I couldn't name one U2 song; and b) I could probably make a case for 25 other rock bands without breaking an intellectual sweat. I was reminded of that as I read this I remember listening to a sports talk show on the car radio a few years ago and one of the two hosts, perhaps to show the breadth of his other-than-sports knowledge, said in as challenging a tone as possible to the other host that U2 was the greatest rock band ever. As if no other opinion was even thinkable. I remember thinking: a) I couldn't name one U2 song; and b) I could probably make a case for 25 other rock bands without breaking an intellectual sweat. I was reminded of that as I read this book because the author was making a similar ipse dixit argument for the supremacy of Chopin, dismissing, in his mind, lesser lights like, say, Beethoven. Beethoven was primarily a composer of sonatas, string quartets and symphonies, and regardless of how much he stretched the formal conventions of each genre, his oeuvre is recognizably a legacy of Classical thinking, a legacy of his teacher Haydn. You know, same old, same old. But, Chopin . . .
Chopin knew the rules; it's just that he didn't muster much enthusiasm for them. Look, I got nothing against Chopin. And, indeed, this book made me appreciate the nuance of his music much more than I ever could on my own. It's just what we love, and who we love, is a very subjective thing. Which brings me to the title and the book description you'll find in the linear notes and add-to-cart page. Chopin's Piano: In Search of the Instrument That Transformed Music. The title refers to a piano - a small pianino - made by a Majorcan craftsman when Chopin and George Sand stayed on the island. Chopin wrote some, but not all, of the 24 Preludes on that instrument. When the couple departed they left the piano there, where it stayed in a monastery for seventy years before being "rescued" by Wanda Landowska, brilliant Polish harpsichordist and Chopin champion. Then the Nazis got their grimy Nazi hands on it. Where will it turn up next? It's a really good story. Stories, actually. You should read this book if only for learning the life of Landowska; you should own this book if only for the beautiful picture on the cover, of her sitting at that piano. But, you know, that piano did not transform music. If the title means that that particular piano served to let Chopin create the 24 Preludes, are we to assume that the 24 Preludes transformed music, more than any other piece of music, by Chopin or Willie Nelson for that matter, transforms music? And why only the Preludes composed on this piano and not the equal number composed on Chopin's Pleyel harpsichord? And, if we're talking solely about musical instruments possibly transforming music, didn't the Steinway brothers accomplish more than the Majorcan carpenter? Just saying. The author didn't really breathe life into Chopin for me. But, oh, he makes Landowska shine. He quotes a music reviewer: When she held on to a fermata (a held note), worlds tottered and breathing stopped until she continued the next phrase. The best rubato is like a golf ball hovering on the lip of a hole that interminable moment before it tips in. Everyone feels these hesitations, both the strange dislocation in time and the absolute rightness when the putted ball drops: the player, the commentators, those watching. It's the time it takes Alice to fall down the rabbit hole, a temporal dislocation easy to sense but difficult to analyze. There are also lots of cameo appearances: Jan Paderewski, Sviatoslav Richter, Herbert von Karajan, a Klimt painting, Curzio Malaparte, Irène Némirovsky, Sybille Bedford, the Monuments Men. Julian Barnes gets a quote. So, read the book. But listen to the Preludes. Again and Again and Again. What a fascinating journey this book takes us on! Organised in two parts, the first explores Chopin's composition of his 24 Preludes in 1838; the second looks at the receptions of the Preludes, Chopin himself and the pianino on which he worked. Much of this second part concentrates on Wanda Landowska, a Polish Jew and brilliant keyboard player - and once we're mid-way through the C20th century both her life and her performances of Chopin get caught up in Nazi ideology. Most of us are well aware o What a fascinating journey this book takes us on! Organised in two parts, the first explores Chopin's composition of his 24 Preludes in 1838; the second looks at the receptions of the Preludes, Chopin himself and the pianino on which he worked. Much of this second part concentrates on Wanda Landowska, a Polish Jew and brilliant keyboard player - and once we're mid-way through the C20th century both her life and her performances of Chopin get caught up in Nazi ideology. Most of us are well aware of the Nazi looting of artworks, but what is revealed here is an equivalent wholesale plundering of musical instruments including grand pianos, harpsichords, spinets and clavichords. What happened to some of these instruments remains a mystery but the attempt to trace them is one of the drivers of the second part of this book. Kildea's narrative is non-linear and digressionary but along the way we look at how performance styles and interpretations of Chopin are inflected historically by e.g. the French revolution of 1848 and the rise of Hitler. This is not (just) a book for musicologists but is accessible and constantly fascinating. Kildea's enthusiasm and learning shine through but never become exclusionary - a wonderful book. It’s not really about Chopin’s piano. Oh, it starts off adhering to its title well enough: Kildea gives some background information about Chopin and his lover, George Sand, an infamous female author who liked to scandalise Parisian salon society by dressing as a man. The two moved to the island of Mallorca for the winter of 1838-39, where Chopin’s lovely Pleyel piano got held up in customs and he was forced to make do with a pianino built by a local craftsman, Juan Bauza. That is the instrument o It’s not really about Chopin’s piano. Oh, it starts off adhering to its title well enough: Kildea gives some background information about Chopin and his lover, George Sand, an infamous female author who liked to scandalise Parisian salon society by dressing as a man. The two moved to the island of Mallorca for the winter of 1838-39, where Chopin’s lovely Pleyel piano got held up in customs and he was forced to make do with a pianino built by a local craftsman, Juan Bauza. That is the instrument on which he wrote his Preludes, “scraps” of music that have baffled listeners, players and critics ever since their premiere. Kildea’s idea, at least to begin with, is that tracing the pianino will shine some light not only on the circumstances under which the Preludes were composed, but on their vexed history of interpretation and performance. Since he also sees the Preludes as a symbol of Romanticism itself, the way in which pianists have approached them – from the ethereal stylings of Cortot to a later Romantic fad for greater attack and intensity, as befitted the larger halls in which public concerts could now be performed, and which publicly performed music now had to fill – is representative, for Kildea, of the history of the artistic movement in general. None of that is particularly evident from the way he structures his book, though; I have come to the conclusion that this is what Kildea wants to explore because I’ve mentally winnowed the many, many pages of digression, distraction, tangent and plain irrelevance with which Chopin’s Piano is riddled. It’s not totally unenjoyable. If you have any interest in historical detail at all, some of it is great fun: descriptions of nineteenth-century Palma, the Mallorcan port town, are vivid (if too long), and the section set in the twentieth century doubles as a primer on the Nazi art-theft industry. (The pianino came into the hands of Wanda Landowska, a Polish pianist who had an affinity for Chopin and his music. Her instrument collection was scattered by the Nazi looting of great Parisian houses; some of it has been put back together, but the pianino has not been conclusively traced.) But there is just so much of it. Barely a few chapters into the book, Kildea launches into an explanation of how a nineteenth-century artist would produce a linocut. It goes on for some paragraphs. This has been prompted by the existence of a linocut of Palma as Chopin and Sand would have seen it. It’s interesting information on its own, but in a book like this, it’s vexing, an obstacle to the reader’s pursuit of the actual story. A biography of sorts for the Mallorcan piano created by Juan Bauza for Frederic Chopin during his & George Sand's brief stay in Majorca. The main significance of this instrument? It is where about half of Chopin's preludes were sketched and refined, before being finished on a Pleyel piano Chopin ordered from the mainland. The book is divided in two parts: the first, of Chopin's life starting from the Majorca trip and through his death (he left the Bauza in the monastery they stayed in) with A biography of sorts for the Mallorcan piano created by Juan Bauza for Frederic Chopin during his & George Sand's brief stay in Majorca. The main significance of this instrument? It is where about half of Chopin's preludes were sketched and refined, before being finished on a Pleyel piano Chopin ordered from the mainland. The book is divided in two parts: the first, of Chopin's life starting from the Majorca trip and through his death (he left the Bauza in the monastery they stayed in) with thumbnails on the music scene of Paris and how the pianos then were transitioning to the sturdy heavy-hitters of Steinway & Sons' cast iron cross-stringed behemoths; and the second, the life of music scholar, Chopin fan, and gifted harpsichordist Wanda Landowska, also a Pole living in France who obtained the Bauza piano but had to leave it in her French apartment when fleeing the Nazis. Predictably, Nazi seizure makes tracing the instrument hard and (view spoiler)[still lost, though the paper trail does carry us into the mid-20th century (hide spoiler)]. The seizure and restitution (still ongoing!) of art under the Nazis are yet another reminder of how they're a political group not to be admired or emulated... but I digress. On November 1838, Chopin, George Sand and her two children, along with Sand’s Chambermaid, travelled from Barcelona to Palma, on the island of Majorca. That famous journey – one that probably contributed much to the island’s current tourist industry – has been firmly etched in our romantic imagery. Having visited the monastery and the cells in Valldemossa, I always have a vision of Chopin composing against the backdrop of its beautiful surroundings. Also well known is how the extreme weather on On November 1838, Chopin, George Sand and her two children, along with Sand’s Chambermaid, travelled from Barcelona to Palma, on the island of Majorca. That famous journey – one that probably contributed much to the island’s current tourist industry – has been firmly etched in our romantic imagery. Having visited the monastery and the cells in Valldemossa, I always have a vision of Chopin composing against the backdrop of its beautiful surroundings. Also well known is how the extreme weather on the island proved detrimental for Chopin’s delicate health, and what had originally been a holiday on a sun-soaked island turned into a near-disaster for Chopin, a man used to the luxuries and comfort of city living. It has always been assumed that Chopin composed most of his works, most notably many of the Preludes, on a piano shipped to him by Pleyel. However, Paul Kildea’s new book, Chopin’s Piano – A Journey Through Romanticism, now tells us that the composer most probably did most of his composing on a piano made locally (in Palma) by piano maker Juan Bauza. Even as late as January of 1839, Sand wrote in a letter to a friend, “Chopin is playing on a poor Malorquin piano”. Pleyel’s much finer instrument was at that point still held up in customs. When it did arrive, Chopin’s playing on it “filled the lofty, echoing vault of the cell with a glorious sound”, and Bauza’s little instrument was “pushed ignominiously to one side, where it would remain for a very long time.” By January 22nd of the same year, Chopin already wrote to Pleyel, “Dear friend, I am sending you the Preludes.” Further proof that the bulk of compositions had already been at least sketched out. In the same letter, Chopin also mentioned completing a Ballade, two Polonaises, and the third Scherzo. In the short time between the arrival of Pleyel’s instrument and the sending of the aforementioned letter, Chopin would have played through the Preludes and other compositions, making minor adjustments, probably writing in pedal markings, before he sent the works off to Pleyel. Unlike the well-oiled operation of Pleyel in Paris, Bauza’s facilities, operations, procedures, and record keeping must have been terribly backwards by comparison. Because of its isolation, Bauza also had very little material to work with, and would have had to improvise as he went along. Nevertheless, under such deprivations, he produced a piano “no more than four feet high, with six and a half octaves of ivory keys and ebony accidentals.” Of course he had no idea that his modest instrument would be associated with some of the most groundbreaking and original music ever composed. I started reading this book expecting a biography (of sorts) of Chopin, with emphasis on his Majorcan sojourn. As it turned out, I was only partly correct in my assumption. The first hundred-plus pages of the book constitute a biographical sketch of the composer, with some detail of his journey to the island. The bulk of the volume, however, dealt with the provenance of the Bauza piano after Chopin, as well as how Chopin’s music, more specifically the ingenious Preludes, has been perceived and interpreted in the years after his untimely death. There was an interesting discussion of the possible tuning of the Bauza piano. At the time, there was furious debate over the merits of meantone temperament versus equal temperament tuning of keyboard instruments. The author presupposes that Bauza’s piano would not be of equal temperament. With the famous Prelude No. 15 in D-flat, which highlights the difference between A flat and G sharp, the middle C-sharp minor section would probably sound more menacing and ominous on Bauza’s instruments. On today’s pianos, the pianist must find other ways to recreate these storm clouds, since A flat and G sharp would sound exactly the same in either key. 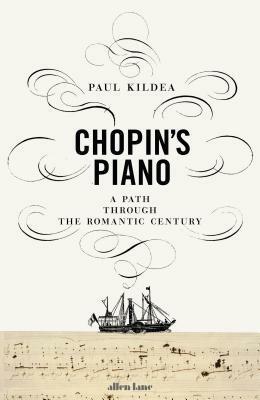 Much of Kildea’s book deals with the perception and interpretation of Chopin’s music following his death. Because of the composer’s poor health, it was assumed, even by his greatest contemporaries, that “Chopin’s frailty instilled in him a uniquely feminine sensibility.” By the 1860’s, this view had been firmly entrenched. The author outlined in some detail approaches to Chopin by some of his most notable exponent – from Liszt, Clara Schumann, Anton Rubinstein, Tausig, Hans von Bülow, to Alfred Cortot, Richter and Arthur Rubinstein in the 20th century. There is some discussion as to shifting ideas about what constitutes “authentic” Chopin playing. Kildea writes that our ideas about playing Chopin have changed so much over the years that if the composer himself were to play for us today, we would probably comment that while it is very beautiful, it is not the “real” Chopin. What is more surprising to me, what I did not before realize, was the story of Bauza’s piano after the composer’s death. On January 31st, 1911, pianist Wanda Landowska (at the time she was still performing standard repertoire on the piano) made a pilgrimage to the monastery in Valldemossa after performances on the island. There she found, not the famous Pleyel piano so associated with Chopin, but Bauza’s modest instrument, untouched for over seventy years. After much effort, she acquired the precious relic in May of 1913. Much of the last half of the book was dedicated to the story of this piano and Landowska’s association with it. After World War II, Landowska, then exiled in America, was trying desperately to recover her properties, library and instrument collection from French authorities. In 1946, when Landowska was living in the United States, she received a letter informing her that many of her instruments had been recovered, included among them the “piano de Chopin”. In spite of her success in the United States, Landowska could not afford the shipping charges, the Bauza piano and nine other keyboards remained in Europe. Gradually, the trail for this holy relic went cold. One source asserts that Landowska brought the piano to the United States, and “took the piano with her to Coral Gables, Florida, where she spent her remaining days.” Others found no evidence that the pianist ever brought the piano to America. The author finishes the volume by conceding that no further clues are in sight as to the fate of the Chopin’s Bauza piano. I believe the author tries to use the Bauza piano as a springboard for giving readers a cultural history of Europe and the United States. To me, the book appears to be part biography, part cultural history, and part detective story. Perhaps because of this shifting focus, it is sometimes difficult to follow the thread of the author’s narrative and logic. Nevertheless, Chopin’s Piano is an interesting read, as well as a welcome addition to the relatively small number of English language literature (other than the many simplistic music appreciation type books) about the composer. For those who are interested in a more straightforward biography of the composer, they could do worse than to go to Adam Zamoyski’s outstanding Chopin: Prince of the Romantics. Kildea’s book, well researched and written as it is, would probably be more rewarding for someone who already has some knowledge of the composer’s life. George Sand’s Un hiver à Majorque gives a colourful account of their sojourn to the island, and is widely available in an English translation. Franz Liszt’s The Life of Chopin is highly subjective and perhaps unreliable as a biography, but would perhaps give us a view of Chopin from the perspective of another great composer, as well as a glimpse into the times. Musicologist Alan Walker’s Fryderyk Chopin: A Life and Times is due to be released in October of this year. If this book is anything like Professor Walker’s monumental three-volume biographies of Liszt, I think Chopin lovers will really have something to look forward to. Overall an interesting book. I enjoyed the glimpses of Chopin and Wanda Landowska but did get somewhat bogged down in the middle basically losing track of the titular piano. I would recommend it. A fascinating albeit quirky book. A double biography? No. A detective store? No. Cultural history? No. And yet it is all three. I have a passing acquaintance with Chopin. I attempted to learn his Polonaise Militaire in A Major, Op. 40, poorly, though others, outside my parents, thought it admirable. These days I couldn't tell you the difference between an arpeggio and a glissando--I'm even surprised I can dredge up those words? I found myself drawn into this depiction of the final years of Chopin A fascinating albeit quirky book. A double biography? No. A detective store? No. Cultural history? No. And yet it is all three. I found myself drawn into this depiction of the final years of Chopin's life, when he had taken up with the French author and iconoclast George Sand, the better known nome de plume of Amantine Lucile Aurore Dupin. The setting for much of the first section is the Spanish island of Majorca where Chopin composed a number of his cycle of Preludes, Op. 28, on a locally made piano by the craftsman Juan Bauza. Unfortunately nothing seems to be know further of Bauza other than his name and the creation of said piano. But it is Bauza's piano which ties the second part, a biography of keyboardist Wanda Landowska, of this book with the first. Ms Landowska was the last known person to possess the Bauza instrument between the World Wars. The piano was looted, along with the rest of her collection of historic keyboard instrument, from Landowska's small estate near Paris during the German occupation of 1940 to 1944. The allied Monument, Fine Arts, and Archives program found and repatriated many of Landowska's collection. But not the Bauza piano. This book is a great history lesson of classical music from the early 19th century onward. I studied the sciences in college, and like most good colleges, mine also required that I take few courses in the arts to make me a well-rounded person. Thus, I was introduced to classical music. I’ll stop what I’m doing if I hear Grieg’s Holberg Suite, the Adagietto from Mahler’s symphony No. 5, or Beethoven’s Pathètique. And then there’s Chopin and his Nocturne No. 1. Yet besides knowing what I like, I do This book is a great history lesson of classical music from the early 19th century onward. I studied the sciences in college, and like most good colleges, mine also required that I take few courses in the arts to make me a well-rounded person. Thus, I was introduced to classical music. I’ll stop what I’m doing if I hear Grieg’s Holberg Suite, the Adagietto from Mahler’s symphony No. 5, or Beethoven’s Pathètique. And then there’s Chopin and his Nocturne No. 1. Yet besides knowing what I like, I don’t know much about classical music. Or art. Or literature for that matter. This book made me feel a lot smarter. Paul Kildea uses Chopin’s 24 Preludes as a thread to weave together a narrative about pianos and harpsichords, the people who made them and the people who played and revered those instruments from about 1830 to 1950 or so. Kildea manages to smash into the book just about every famous musician, artist, and writer who lived in that period and before, from Auden to Zola, yet telling a story as if the Preludes were the protagonists. The book really isn’t about Chopin’s piano, although it makes an appearance every 40 or 50 pages; rather it’s about European history, music, art, and romanticism. It’s about Chopin and his wife, George Sand; about Wanda Landowska; about other famous musicians; about Pleyel keyboards and other instruments; about Paris; about the Preludes; and about music interpretation told against a backdrop of the Franco-Prussian War, the French Revolution and other European upheavals, and then persecution of Jews and World Wars I and II. This is a beautifully written book and should make Chopin and Wanda Landowska fans happy. It may not have much for the layreader. The mystery of the piano mentioned is a non-starter. If you want to read about it, begin with the book's opening chapters about Chopin and Sand in Majorca (and do not expect salacious tidbits about their relationship) and then read the penultimate chapter. In between is a discourse on the life and performance art of Wanda Landowska, arguably one of the finest if not t This is a beautifully written book and should make Chopin and Wanda Landowska fans happy. It may not have much for the layreader. The mystery of the piano mentioned is a non-starter. If you want to read about it, begin with the book's opening chapters about Chopin and Sand in Majorca (and do not expect salacious tidbits about their relationship) and then read the penultimate chapter. In between is a discourse on the life and performance art of Wanda Landowska, arguably one of the finest if not the finest interpreter of Chopin's music, who did own the piano of the title, as well as two Chopin harpsichords. Kildea also describes the tremendous looting of art works and musical instruments done by the Nazi regime during WWII and to which Landowska fell victim. An interesting read, quite dense but followed an exciting trail through history, making the nuances of WW2 and life as a pianist more tactile and real. It opened my eyes to a whole side of the war that I previously hadn't considered very much, so the insights this book gives both historically and musically is worth the read. Good musical knowledge is required, and preferably a passion for history, Chopin and piano - not necessarily in that order! There is a lot of historical context presented in this book but my favorite parts were when the author wrote about the 24 preludes that Chopin wrote in Malta during the winter of 1835. I was able to listen to all 24 on YouTube while reading about their composition. I can understand more why they were distinct from anything else composed by other Romantic composers and remain very well known and popular. I predicted a chronology of the instrument, and while it is there, it’s far more about the man who ordered it and the people he and it touched. Didn’t finish. Painfully disjointed book, lacking in any coherent structure. Chopin in Mallorca is of course a good proxy for Keats in Italy. Wanda Landowska has a very nice picture on the cover, but it's George Sand that steals the show.